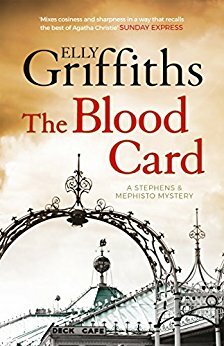 The Blood Card by Elly Griffiths is the third book in the new Stephens and Mephisto or Magic Men series. As an ardent fan of Griffiths' first series, Ruth Galloway Mysteries, I didn't know if I could love this second series as much. Rather like a mother pregnant with her second child wondering if a new child could ever be as thrilling as the first. Well, having had two children, I know that the second child brings out every bit as much love as the first. And, having now read three books in Elly Griffiths' second series, I know that I have plenty of love to go around for it, too. Set in the early 1950s, the historical aspect of England shortly after WWII is fascinating, and the added presence of the variety acts, especially magic, that had long been a part of the British theater of performance create a setting that is constantly evolving amidst the changes of a new world after war. The story begins at a pivotal point in British history after the war, the coronation of Queen Elizabeth II, a new era of a woman once again on the throne of England. Preparations for the coronation are busy everywhere throughout England, from the ceremony and events in London to the celebrations throughout the towns and villages of the country. The few days before this spectacular event finds Detective Inspector Edgar Stephens investigating the death of a Brighton Gypsy fortune-teller, who met her fate of drowning by either her own hand or someone else's. Max Mephisto, Edgar's friend and former teammate in the Magic Men unit for diversion and misdirection in WWII army operations, is performing his famous magic act in London at the Theatre Royal. A mysterious call from a General Petre brings both men to the London address of their former commander, Colonel Cartwright, who has been murdered. With Cartwright's body having already been removed by the police, Edgar and Max are asked to look around for clues. The most significant is the discovery of the ace of hearts playing card, which Max recognizes right away as the "blood card." There is also an old playbill for a variety performance show, a crossword puzzle, and a news article featuring a story about an American mind-reader. Not easy clues to decipher, but ones which the friends are determined to follow. Petre also tells Max and Edgar that General Cartwright was on the trail of an anarchist scheme to disrupt the coronation when he was killed. Before he can say Bob's your uncle, under the direction of General Petre, Edgar is on a plane to Albany, New York to decipher why his old commander had the article about the American performer in his possession, with the man's phone number on it. Edgar's experiences in Albany further convince him that there is a connection to the murder investigation. Meanwhile, Max is busy contacting past members of the Magic Men to try and uncover if there's a connection to Cartwright's death. Max is also preparing for his television debut in a variety show to be part of the coronation celebration. His daughter Ruby is also on the show, and they both could be in danger's way. And Emma Holmes, Edgar's Sergeant on the Brighton Police force, is conducting a dogged inquiry into the death of the Gypsy woman, Madame Zabini, and in the process discovers disturbing and important information tied to an anarchist scheme. Edgar, Max, and Emma arrive at a shocking conclusion in their investigations, but the timing may be too late. The two areas which I was especially enamored of in book #3, besides, of course, the story itself, were the historical features and the further development of minor characters. With so much written about WWII itself, this series is a breath of fresh air in its setting of the early 1950s when rationing was still in effect, television was just becoming a desired item (which the televised coronation did much to promote), variety stage shows were undergoing a shake-up, and air travel was new to most people. Griffith's description of the flight Edgar took to New York was marvelous. So different than modern day plane trips, the amenities described are unbelievable. I won't spoil the description here, as it's such a delight to read. The reactions to having a television set in the home, from it being front and center to it being hidden away with curtains drawn across it to conceal it, are as entertaining as the forum itself. The Blood Card takes us further into the supporting characters' lives, too. Emma Holmes, who is one of my favorites in the series, has her role expanded into sharp investigator, infatuated admirer of Edgar's (but in a dignified manner), and unsettled daughter. Ruby, who is Edgar's intended is given more insight as to her motivation, ambition, and feelings for Edgar. The variety of entertainers is always enchanting, with their talents and quirks exposed. I felt that this book has brought so much together for the reader of the series, connected so many dots, with, of course, many story threads that could go down many different paths. Elly Griffiths is a master pacer, and her delivery of these developments is perfect timing. I do hope that those who are devoted fans of the Ruth Galloway series are giving the Magic Men series its proper attention, too. Elly Griffiths is no one-trick pony. She is a brilliant creative source for multiple stories and multiple characters. To limit her to one set is to deny great storytelling to be shared in all its glory. This reader will take all she can get from this author because it's all exceptional reading.